As the LaBarre Larceny Scandal which procreated this assault on American liberties is directly linked to "the worst bank foreclosure fraud in US history" and a byproduct of egregious banking abuses of MorganStanleyGate, involving Morgan Stanley, Wells Fargo (through its Wachovia subsidiary) and Paragon Commercial Bank, a movie (and book deal) is now in the works because . . . This charade needs to stop, and know that Lawrence Campbell and Antoinette Hilliard have been unresponsive and entirely uncooperative. 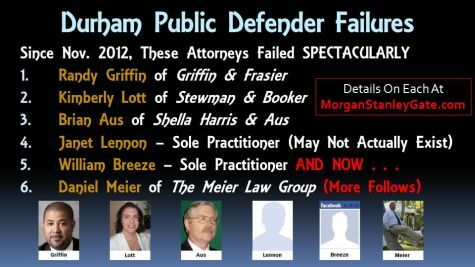 It is quite obvious they have intentionally failed to faithfully carry out the responsibilities of the Durham Public Defender's Office . . . for it would otherwise be impossible for SIX consecutive public defenders to fail so fantastically. In an environment devoid of corruption, SIX consecutive failures is statistically impossible. Sadly, I would also like to point out that Bob Ekstrand and Samantha Ekstrand of Ekstrand & Ekstrand (who have been involved all along and copied on ALL related correspondence) were very much part of this insidious FRAUD, and played an instrumental role in this effort to "set me up" by luring my attendance at these entirely BOGUS hearings, so that my ability to defend myself would be decidedly compromised and effectively defenseless -- the plan was to jail me (on more concocted nonsense) if I showed up at this May 6 hearing. Throughout this subterfuge, they pretended to be diligently working on my behalf to facilitate a resolution (e.g., assurances that they had negotiated a dismissal of ALL 3 FABRICATED charges), together with false assurances that they would take on my case (and associated civil claims), or otherwise engage someone who would. They then abruptly went incommunicado and have abandoned me altogether. 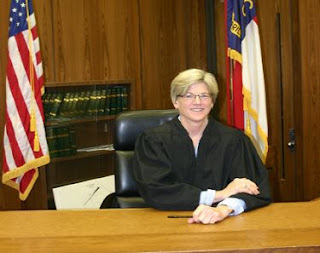 This is deceitful treachery at its very worst, and suggests a profound lack of judicial and legal integrity is endemic to Durham and likely the surrounding Triangle area. I have entered into an agreement with a prominent author, screen-writer and documentary producer to expose this BOMBASTIC FRAUD . . . as it is far more incredulous TRUE STORY than Changeling, starring Angelina Jolie and John Malkovich, and because it has oppressed MANY MORE PEOPLE. Moreover, since it is directly linked to "the worst bank foreclosure fraud in US history" (go ahead and Google it) and other banking abuses, tens of millions of people will be able to relate to this travesty in some way. I am confirming receipt of your e-mail at 2:40pm today. Judge Morey is out of the office this afternoon attending a conference. I am, however forwarding your e-mail to Judge Morey in hopes that she receives it.